Although stock market volatility and global economic concerns highlighted the first six months of the year, the U.S. economy continued to expand through the first half of 2016. According to the latest Beige Book, seven of twelve Federal Reserve Districts, including the Minneapolis District, reported modest to moderately increasing economic activity. Providing an optimistic outlook, healthy consumer spending continues to support activity for nonfinancial services, and strong underlying fundamentals in the real estate sector and increasing infrastructure investment are driving construction activity. Meanwhile, the strength of the dollar and weakness in the energy sector continue to serve as significant headwinds for manufacturers, though the outlook in the manufacturing sector improved in the second quarter. Weakness in the energy sector and a strong dollar are serving as a drag for manufacturers at the national, regional, and local levels. After slipping into a technical recession in November of 2015, positive indications in the manufacturing sector began to emerge in the first quarter of 2016 before demonstrating noticeable improvements in the second quarter of 2016. According to the ISM Report on Business®, the PMI® was recorded at 53.2% in June of 2016, down slightly from 53.5% noted 12 months prior, but up significantly from 48.0% recorded at the close of 2015. In comparison, economic activity in the non-manufacturing sectors expanded for the 77th consecutive month in June of 2016. 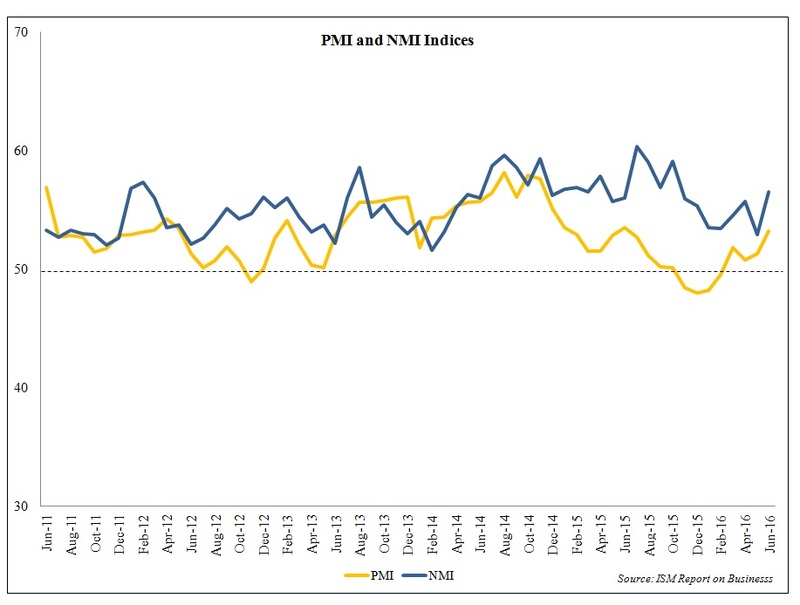 The following graph presents the five-year historical PMI® and NMI® index readings. The energy industry continues to be hamstrung by a glut of supply and tepid demand, yet heavy debt loads prevent many domestic producers from further curtailing production. Spot prices for West Texas Intermediate and Brent crude in May of 2016 were both down over 50.0% compared to year-end 2013, putting significant pressure on exploration, drilling, and oilfield service firms. Retail gasoline prices have fallen by nearly 30.0% during this same period, providing considerable relief to consumers and facilitating stronger margins for midstream firms. 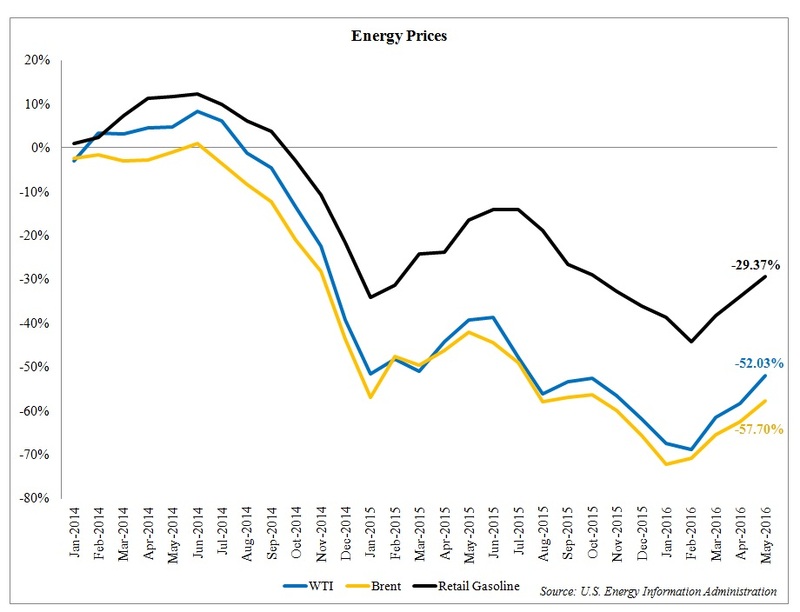 The following graph presents retail gasoline and crude oil price performance since the close of 2013. In spite of global economic concerns and headwinds facing the energy and manufacturing sectors, improvements in the labor market, a stronger housing market, consumer confidence, and encouraging business investment, outside of the energy sector, support a cautiously optimistic economic outlook. Further, readings from leading indicators suggest the national economy at the national, statewide, and local levels will continue to grow at modest pace through at least the immediate future. Non-farm employment at the national level increased by 1.7% over the year ended in June of 2016. Job growth in the service-producing sectors is leading increasing overall payroll figures, with the most robust gains noted within the professional/business services and education/health services sectors. From a year-over-year perspective, payroll figures in the service-producing sectors increased by 2.0% in June, followed by the government/public sector (0.6%) and the goods-producing sectors (0.3%). 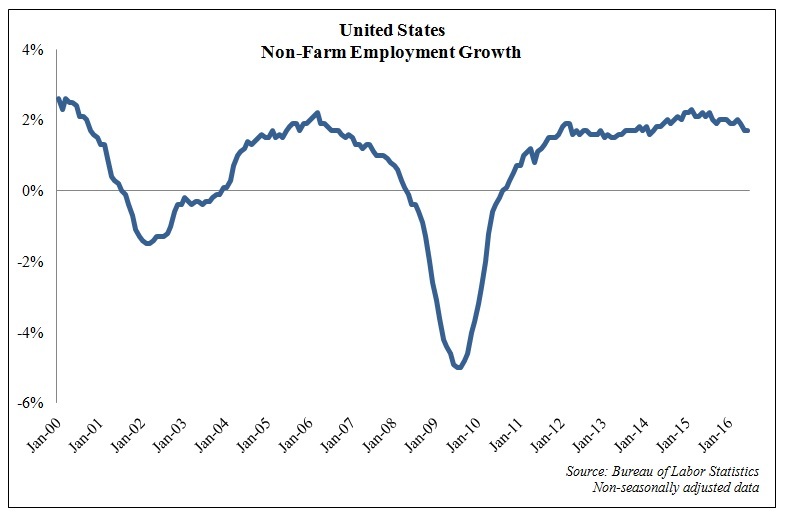 The following graph presents overall national non-farm employment growth. Employment gains across nearly all major markets continue to put downward pressure on unemployment rates from coast to coast. In turn, tighter unemployment rates and a shortage of skilled labor are putting upward pressure on wages, as many companies are facing difficulties attracting and retaining higher quality workers. Nationally, the non-seasonally adjusted unemployment rate decreased to 5.1% in June of 2016, down 40 basis points from 5.5% recorded one year prior. In comparison, the non-seasonally adjusted unemployment rate in the state of Minnesota stood at 3.3% in June of 2016, down 50 basis points from 3.8% recorded in the prior month and 20 basis from 3.5% in June of 2015. 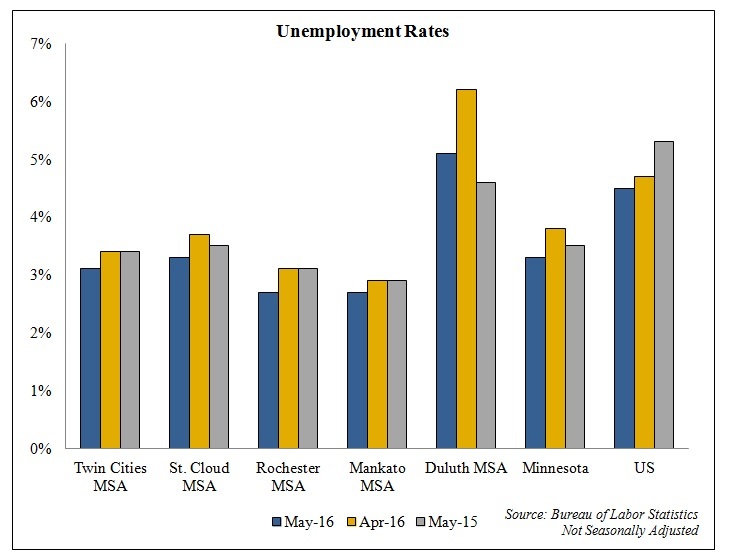 From a statewide perspective, unemployment remains lowest in the Mankato and Rochester markets (2.7%), followed by the Twin Cities (3.1%) and St. Cloud (3.3%) markets. The following graph presents non-seasonally adjusted unemployment rates at the national, regional, and local levels. Non-farm employment in the Twin Cities metropolitan area increased by 1.5% over the year ended in May of 2016 on the net addition of 28,400 jobs. Mirroring trends observed at the national level, growth in the Twin Cities market was strongest within the education/health services and leisure/hospitality (2.5%) sectors, which combined to add 15,000 jobs. 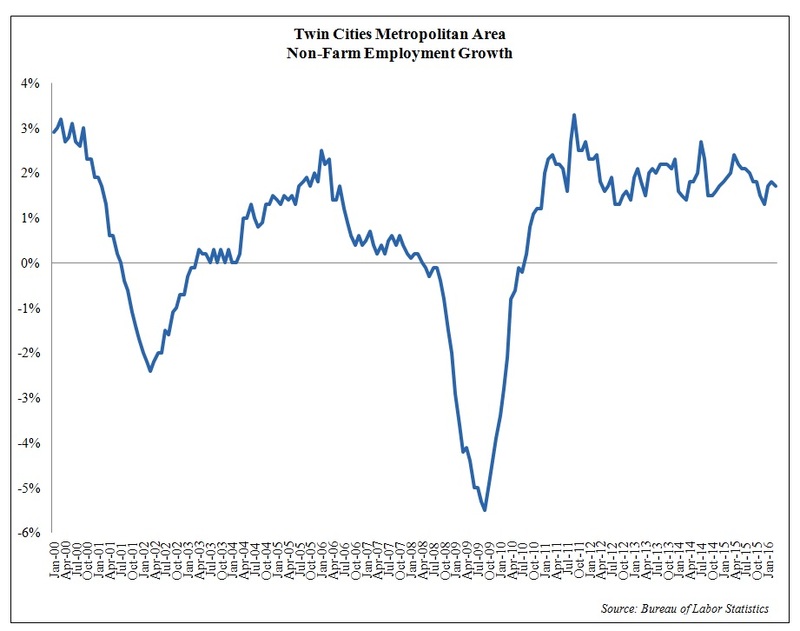 The following graph presents overall non-farm employment growth in the Twin Cities metropolitan area. Confidence among business owners and investment activity suggest the Minnesota economy will continue to expand at least through the near term, likely outperforming trends observed at the national and regional levels. According to a recent survey conducted by the Minnesota Department of Employment and Economic Development, a majority of business service firms anticipate growth in sales and profits in 2017. Moreover, the employment outlook among business service firms remains encouraging, with 92.0% of respondents expecting stable or improving employment conditions. Private and public investment activity within the state of Minnesota also provides an optimistic outlook. Kraft Heinz announced plans for a $100 million investment in the company’s production facility in New Ulm, which will add four new production lines and 50 new jobs at the facility by the close of 2017. Cliffs Natural Resources announced plans to invest $65 million over the next two years and restart options at the United Taconite mine and pellet plant on the Iron Range in August. In addition, executives at Mayo Clinic announced in June they are seeking to find a developer to help build out more than 1 million square feet of clinic-owned land within the Discovery Square district as part of the Destination Medical Center. Residential and commercial real estate markets throughout Minnesota also remain strong. Most notably, the for-sale residential sector in the Twin Cities market has demonstrated impressive growth through the first six months of 2016. The number of year-to-date closed home sales in the Twin Cities market increased by 6.2% through May of 2016, while the median home sale price increased by 5.6%, rising from $214,000 in May of 2015 to $225,900 in May of 2016. Further indicating healthy demand, the average days on market decreased by 16.5% and the percentage of original list price received increased by 1.1% during this same period, as available inventory remains relatively limited. Activity in the for-sale residential sector also appears to have spurred a more bullish outlook from homebuilders, as permitting activity in the state of Minnesota is up over 18.0% year-to-date through May. Despite stronger competition from the for-sale residential sector, conditions in the apartment market remain healthy, with underlying fundamentals in the Twin Cities apartment market remaining among the strongest in the nation. Benefitting existing apartment owners and operators, new apartment construction activity may have reached a cyclical peak, as year-to-date multifamily permitting activity is down over 45.0% compared to the first five months of 2015 and down nearly 55.0% compared to the first five months of 2014. Demographic trends are in place to suggest demand for apartment units will remain healthy over the long term, and a decline in the pace of new construction will put upward pressure on occupancy levels and asking rents. Further, benefitting apartment owners has been the run-up in housing prices in the local Twin Cities market. 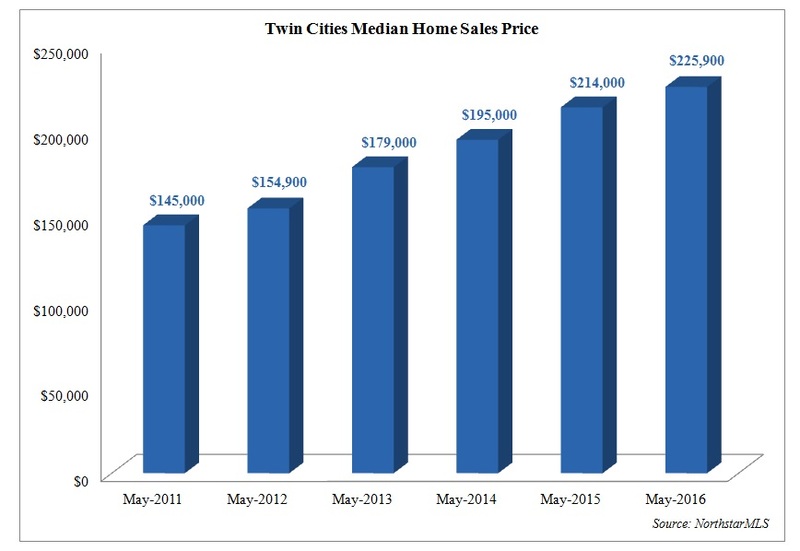 The following graph presents median home sale price trends in the Twin Cities metropolitan area. Although there has been a great deal of discussion on the pace of apartment rent growth in recent years, the median home sale price in the Twin Cities market has quietly increased by an average of approximately 9.25% annually over the last five years, rising from $145,000 in May of 2011 to $225,900 in May of 2016. Rising home sale prices and a scarcity of desirable for-sale inventory will continue to keep some potential homeowners in the renter pool. On the investment side, capital in the apartment market is becoming more selective and disciplined, but strong interest from apartment investors has been observed for 1970s and 1980s vintage value-add deals through first six months of 2016. This trend which appears to be in the early innings as construction costs continue to climb at a relatively steep trajectory and investors continue to see healthy returns on investment in value-add deals. Improvements also continue to be noted within the commercial real estate sectors in the Twin Cities market. Vacancy rates in the retail sector continue to tighten, putting significant upward pressure on rents. Although an overall net gain for the local market, rising asking rents for retail space have held back demand to some extent, as the swift pace of rent growth is beginning to price-out some retailers from entering or expanding in the Twin Cities market. Investment activity in the retail market continues to remain strong for single-tenant net lease properties, particularly for newly-built drug store and quick service restaurant assets, while grocery-anchored shopping centers also remain in favor among investors. In the local office market, healthy absorption continues to support improving underlying fundamentals. Significant improvements in market fundamentals have been noted within the St. Paul Central Business District (CBD) in the most recent quarters, as the core of St. Paul emerges as a live/work/play destination and office-to-apartment conversions continue to remove space from the existing inventory. Two big question marks for the office market, however, are lingering. The first question is whether organic demand will remain strong enough to absorb the existing space vacated by tenants shuffling into newly built office product. Second is the degree to which Financial Accounting Standards 13 (FAS 13) will impact the office market. Although the goal of FAS 13 is to create greater transparency for stakeholders, the response from the market to this newly available information will dictate the degree of impact. Data referenced in this report was current as of July 8, 2016, and includes preliminary figures, which are subject to revision. Several articles by Shenehon Company appraiser John Schmick were identified in the Spring 2016 issue of the Appraisal Journal as important resources for appraisers. The Journal is the official publication of the Appraisal Institute and is the industry’s leading publication. Schmick’s expertise in corridor valuation was included in Resource Center, an Appraisal Journal column by Dan L. Swango, PhD, MAI, SRA. 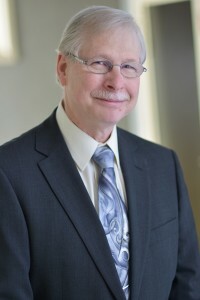 Swango is one of the most well-respected valuation experts in the United States. You can see Schmick’s extensive list of published articles and access the articles by visiting his online bio at www.shenehon.com/john-t-schmick/. Congratulations John on being recognized in Appraisal Journal! External obsolescence is a type of depreciation that results from external influences, and often reduces the value of a property. For example, if a landfill is constructed next to a home, the value of the home will likely fall, through no fault of its own and regardless of the condition of the home itself. Several years ago, Guardian Energy (Guardian) contested the property tax value assessed to their property in Waseca County, Minnesota. Guardian Energy operates an ethanol plant on 140 acres in Janesville, and felt the County Assessor’s values for the property in 2009, 2010, and 2011, were too high. After their grievances were heard by the Tax Court, an appeal was made to the Minnesota Supreme Court. The case was eventually heard in 2015 by the Minnesota Supreme Court, which focused on two issues: 1) whether the determination that the ethanol tanks on the property were real property, and 2) the tax court’s independent determination of external obsolescence. For this article, we will only focus on the application of external obsolescence. Guardian’s property, however, was not a run-of-the-mill office building, where any number of businesses could operate. 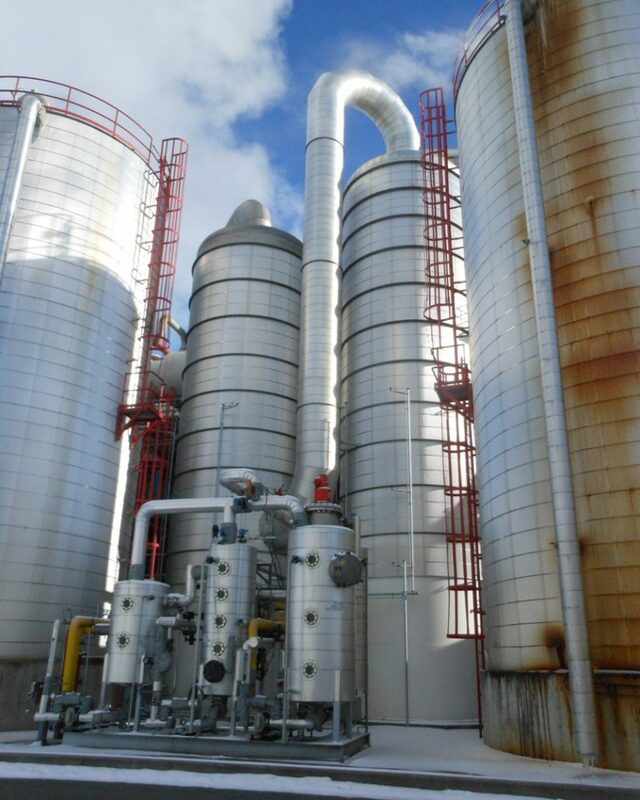 An ethanol plant is a special-purpose property, and the County, while estimating slightly different reduction percentages, agreed with Guardian’s methods in this respect by also considering the price per gallon and general industry trends in its calculations. The county concluded 45 percent, 35 percent, and 25 percent reductions for external obsolescence for each year, while Guardian Energy used 33 percent for all three years. Rather than relying on the testimony of either side, the tax court used an entirely different approach to calculate its own determination of external obsolescence. By taking national levels of demand and comparing these to levels of production, the tax court determined the property’s function obsolescence reduction at 16 percent, 8 percent, and 0 percent. While the tax court would have been within its rights to reject the methods used by both sides, if it deemed them inappropriate, it would still be required to explain why it used the method it ended up choosing. The Supreme Court decided that the tax court failed to adequately explain its reasoning for selecting this particular method of determining external obsolescence and failed to show that the method it selected is an accepted approach. The Supreme Court could also not understand how the property value could be separated from the value of the viability of the business, because as stated previously, this was a special-use property that could only have one practical use, and “capitalization of the income loss attributable to the negative market influences is a generally respected approach to calculating external obsolescence.” The Supreme Court acknowledged the complexity involved in determining the value of property and would not provide an opinion of which method(s) should apply, but instead recommended the case be remanded to the tax court for further proceedings. Shenehon Company supplied the appraisal report for Guardian Energy.